We asked the broader climbing community what they thought of The Mountaineers, and we received lots of great feedback. 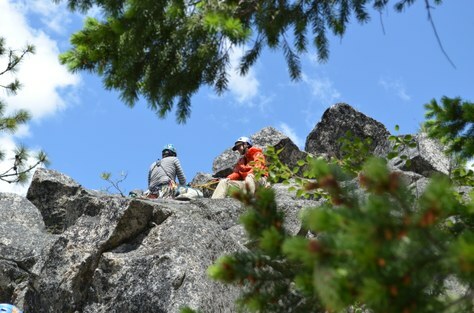 Find out what climbers in Washington had to say. The Mountaineers is embarking on a project we're calling Progressive Climbing Education - an initiative to re-think our program design to better meet the needs of the climbing community and better achieve our mission. The first step is an intensive information-seeking process to find out what's working and what needs to change. We sent a survey to the broader climbing community and received more than 200 thoughtful responses. What is The Mountaineers doing well? How are we serving the community? What aren't we doing well? What is keeping people away from The Mountaineers? What aren't we doing now that we should start doing? We intentionally left the questions open-ended and avoided multiple choice questions (which can be leading). We really wanted candid answers. To move forward, we needed to learn what you - our community - thinks of The Mountaineers. We were humbled and impressed with the time and effort so many people put in to giving us input. While some of the input we received confirmed our existing hypotheses, we also gained new insights to help inform our next steps. We heard consistent themes and gained ideas for things we should start doing. We've outlined our findings below, and invite you to view the survey responses for yourself. Note we have two reports: one report contains responses from non-members, and the other contains responses from members and past members. We have a responsibility to develop skilled and responsible climbers who will add value to our climbing community and steward our public lands. With our growing population and interest in climbing, The Mountaineers needs to help ensure that people going into the mountains and to the crags are safe and treat others with respect. We learned of a few ways we're doing a good job and how we're falling short, but most people agree The Mountaineers have an important role in the community to fulfill. Our community impact is generally positive, while our impact in climbing areas is often detrimental. We offer great community events (42%), publish great books (20%), and create a sense of community among climbers, but when we get into our wild places, our party sizes are too big (23%), our participants can be slow and block routes, and our instructors can be rude or arrogant (14%). We offer access to affordable education programs that help get people outside with basic skills to keep them safe (52%), and we help develop future conservationists. However, many climbers find our curriculum and techniques to be outdated and rigid (22%) in a time when climbing education needs to be responsive to ever-changing technology and conditions. Inconsistency in the skills of our volunteer leaders and instructors can compromise the safety and enjoyment of participants and other climbers (13%). 20% of non-members and 38% of members and past members shared that we need to raise our standards when it comes to instructor training and modern and consistent curriculum. Many people are interested in joining but struggle to figure out how to get involved. Our classes fill quickly with long wait lists, making it difficult for people to join without planning 6 months in advance (5%). Our course schedules and the intense time commitment of some of our courses make participation impossible for many people (26%). Our prerequisites can be difficult to navigate, and those looking to join at an intermediate level can't figure out how to bypass the introductory courses (17%). Those wanting advanced skills find a lack of options in The Mountaineers. Those looking for a specific skill can't find a short course and instead have to enroll in a comprehensive course (16%). Community outreach matters. Many people commented on the importance of The Mountaineers partnering with the broader outdoor community (7%). Some even made it a point to thank us for asking for community input through this survey (5%). Our events partnering with climbing groups, advocacy groups and other outdoor clubs are viewed as a key contribution to the greater good (22%). Many people feel that we are not as present as we should be at community events and in conversations with other climbing and access groups. We're sincerely grateful for the time and effort our fellow climbers put in to providing feedback. We take our responsibility for developing safe climbers, building a welcoming community, and protecting our outdoor spaces very seriously. The thoughtful responses we received from the broader climbing community reinforces that responsibility, and we are grateful to know that so many folks in the community are supportive of this initiative. Over the next 6 months, we'll be working with a Climbing Education Advisory Committee comprised of both Mountaineers folks and folks from climbing gyms, guide services, the Access Fund and other nonprofits to reimagine our climbing programs. Our goal is to preserve what is special and uniquely wonderful about Mountaineers programs and to change the things that aren't working so that our programs can better serve our community. Our Board of Directors has invested in skilled consultants to facilitate the process, and we are moving forward with both a sense of urgency and a commitment to deep listening and critical thinking. We welcome you to stay connected and follow us through this process. We'll be posting blog updates at www.mountaineers.org/pceblog on a monthly basis. These seems to constitute a very small proportion of the climbing population. Are results representative? Are conclusions valid? Great questions, Doug. To clarify, this blog is not listing conclusions we've drawn, rather it is a summary of what we heard specifically (and exclusively) from the survey responses. We are striving to take the most informed approach possible, and so the survey is just one of the ways we're gathering information. We held three listening sessions to which all members were invited and gathered data from 73 members at those sessions. We also conducted in-depth interviews with 3 staff, 3 members and 3 non-member climbers in the community. Our Climbing Education Advisory Committee consists of 6 leaders in the climbing community who are connected to the climbing community at large through their leadership in climbing gyms, the Access fund, guide services, REI, and Petzl. It will also consist of 6 leaders in the Mountaineers climbing community from four different branches. We are eager to gather as many perspectives as possible, and we also need to adhere to a timeline out of respect for the people volunteering their time to help with this. We did not use scientific methodology in conducting this survey, so we can't speak to whether the results are statistically representative, but we believe the responses we received were thoughtful, insightful and worth listening to. If there are additional ways you recommend we reach out, please let us know. Some of the long response are truncated from the "View response" link. Can we get the full text without too much navigation? I am fine to read a list of all response in one page without any format or navigation button. Thanks. Very comprehensive survey. A lot of the 'needs work' comments seem like they come from people with intermediate experience looking to get involved in a new group. I want to improve skills, find people to take trips with, and not relearn basics.